During the month of October the Pomona Police Department is participating in the Pink Patch Project to combat breast cancer by raising the public awareness. Pomona Police offices will be allowed to wear pink versions of their department uniform patches for the entire month of October. 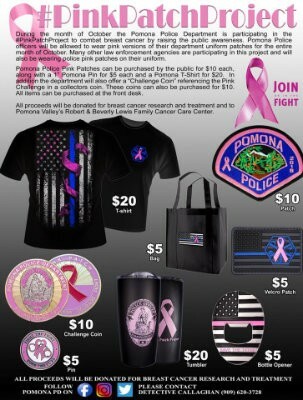 As part of this initiative, Pomona POA is selling their pink patches directly to the community for $10 each, along with lots of other items. All the proceeds will be donated to support cancer research and treatment and to Pomona Valley's Robert & Beverly Lewis Breast Cancer Care Center.